The Samsung Galaxy S6 has emerged as the benchmark for flagship smartphones running Android, but there are lots of challengers, including the new G4 from LG Electronics. A more premium design has been a common theme for this year’s launches of high-end smartphones. The Galaxy S6 combines a metal frame with a glass back, while the G4 has a plastic frame and offers the option of a back made of leather or a mixture of ceramics and plastic. 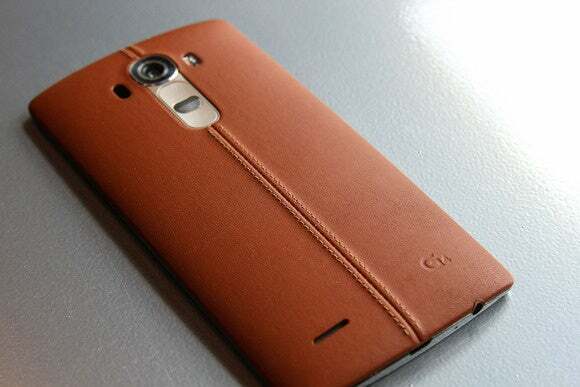 The G4’s leather back (pictured at top) looks good, but the other materials aren’t on the same level. Still, the leather gives the phone a pleasant texture, and the G4 feels better to hold than the Galaxy S6, which is the better looking of the two. Both the Galaxy S6 and G4 are powered by ARM-based processors, though with slightly different configurations. The Snapdragon 808 is LG’s processor of choice for the G4. It is the first to pick that chip, and the reasoning was that it offers the best balance between high-end performance and power efficiency. The processor uses the same ARM cores as Qualcomm’s top model, the Snapdragon 810. Both chips use four Cortex-A53 cores, but while the 810 has four Cortex-A57 cores, the 808 has two. The Galaxy S6 is powered by its in-house developed Exynos processor that also has four Cortex-A53 cores and four Cortex-A57 cores. The Samsung Galaxy S6 Edge's display. Samsung and LG are in agreement that a smartphone in the high-end segment should have a screen with a 1440 x 2560 pixel resolution. But they differ on what’s the best screen size: the Galaxy S6 has a 5.1-inch screen while the G4’s screen measures 5.5 inches. Competing vendors make the case that the addition of the higher resolution takes too much of a toll on the battery. However, the screens on the Galaxy S6 and the G4 look really good, and features like quick charging make a shorter battery life less of a hassle. 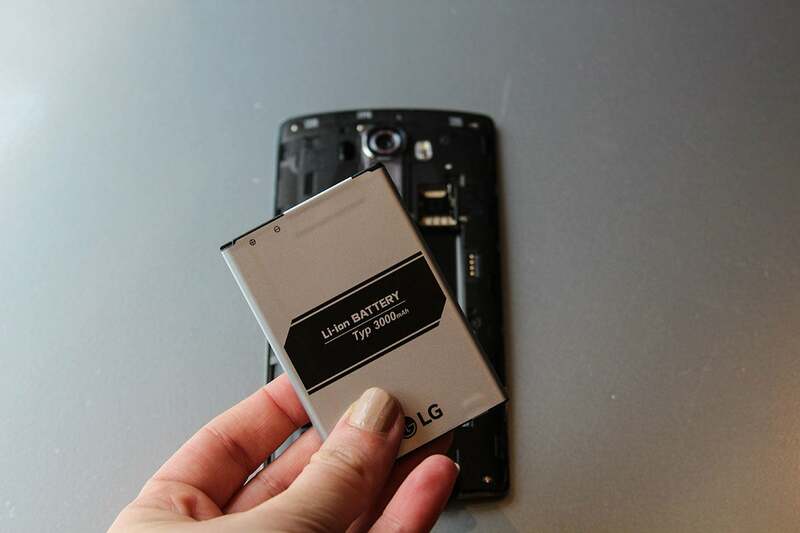 The G4 also has a user exchangeable battery. The big screen on the G4 comes at a cost. The Galaxy S6 is 17 grams lighter than the G4, which weighs 155 grams. The Samsung device is also smaller: it measures 143.4 x 70.5 x 6.8 millimeters compared to the G4’s dimensions of 148.9 x 76.1.7 x 9.8 mm. The G4 is unfortunately bigger and heavier than its predecessor, the G3, as well. The LG G4 also has a removeable battery, which Samsung shunned in the Galaxy S6. Samsung and LG have chosen slightly different approaches when it comes to integrated storage. The Galaxy S6 comes with 32GB, 64GB or 128GB, while the G4 has 32GB of storage. But people who chose the latter can expand the capacity using the MicroSD card slot, which Samsung decided to skip. The optimum configuration would be 64GB and a MicroSD card slot, so neither company gets it completely right. Smartphone vendors have long relied on camera improvements to help convince users to upgrade, and the G4 and Galaxy S6 are no different. The main cameras on both models have a 16 megapixel resolution. And features such as optical image stabilization help improve performance in low-light conditions. The Galaxy S6 has a 5 megapixel front camera and the G4 has an 8 megapixel version. It seems the G4 will be the cheaper of the two. The smartphone will cost from £500 ($765) including tax and without a contract, compared to £600 for the 32GB version of the Galaxy S6 when buying it from Samsung. The G4 will start its global rollout on Wednesday in Korea and is expected to go on sale in Europe and the U.S. at the end of May.